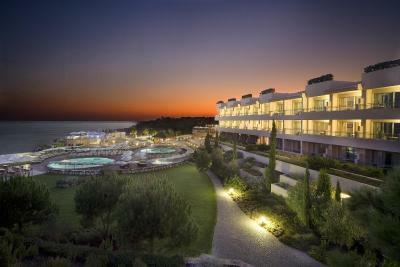 Lock in a great price for Grande Real Santa Eulalia Resort & Hotel Spa - rated 8.7 by recent guests. The tranquility of the place, well equipped kitchen, loads of English TV channels, sunny terrace, pools, the staff and most of all the stunning beach! Beautiful location, couldn’t ask for a better beach. Not far from main shops and restaurants and amazing breakfast! 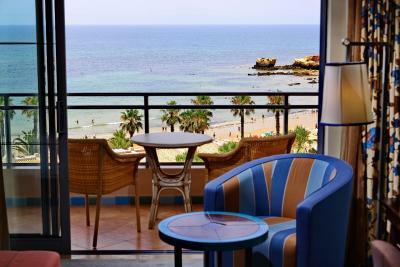 Excellent location, hotel facilities and staff extremely friendly! They organised cake and balloons for my daughter's birthday which was greatly appreciated. Location is stunning and close to various amenities. The beach is stunning and for self catering it suited us. The whole ambiance was welcoming and kids enjoyed the pool, closer to beach, the breakfast was v good. Great hotel with beautiful views, friendly staff. Free bus to old town which was a real bonus! Hotel was spotless, staff friendly and food good. We were self catering and the apartment was a fantastic size. Food was good. Grounds nice. Most staff are very nice and helpful. We god a very good deal for accommodation. Housekeepers were great. Very obliging and friendly. 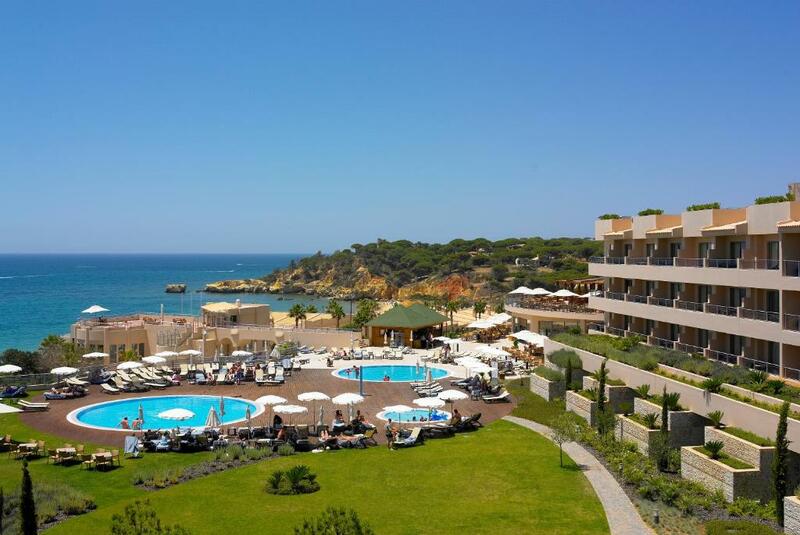 One of our top picks in Albufeira.Located in Albufeira, Algarve, the 5-star Grande Real Santa Eulalia Resort & Hotel Spa features direct access to the Santa Eulália Beach, 4 outdoor swimming pools plus 3 for children and a Thalassotherapy Spa with specialised staff. 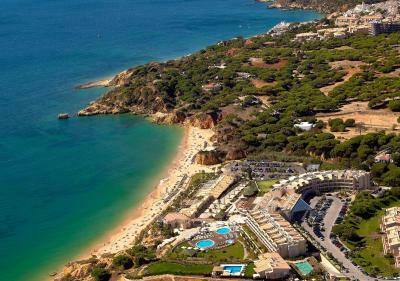 The Grande Real Santa Eulália includes accommodation that will fit every families’ need. 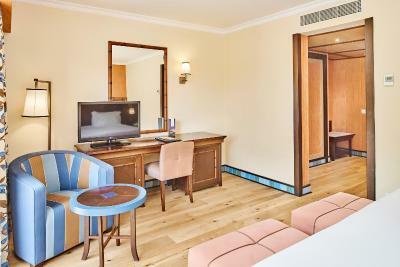 Each room, suite or apartment comes with air conditioning, digital TV and a balcony. Guests may prepare their own meals if they are accommodated on a self-catering unit. Alternatively there are 3 restaurants on site which offer a variety of options to guests from Portuguese to International cuisine. In the evening guests may relax at one of the on-site bars. In addition there are 3 pool bars serving refreshments and snacks. The Real Spa Therapy includes 17 treatment rooms, a pool with Thalasso Circuit, massage rooms, relaxation areas, a sauna, a cocoon, a hamman, a gym and other wellness facilities. The Realito Kids Club offers music, games and entertainment for children of various ages. During the summer guests can unwind at the Le Club disco. 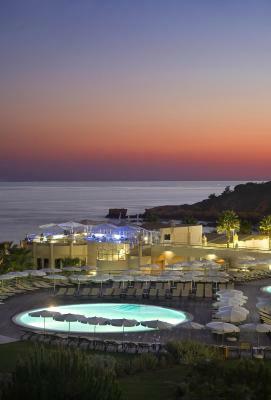 Grande Real Santa Eulalia Resort & Hotel Spa provides free parking outdoor or in subterranean garages. Balaia Golf Course is 0.6 miles away, the Albufeira Old Town area is 2.9 miles away while the lively Oura Strip is just 1.1 miles away. 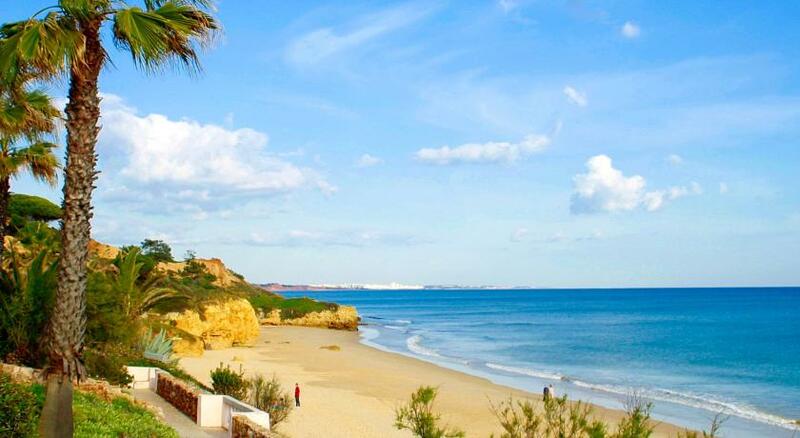 The extensive Falésia Beach is 2.1 miles away and Faro International Airport is 22.4 miles away. 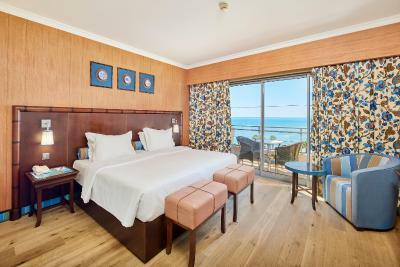 Grande Real Santa Eulalia Resort & Hotel Spa has been welcoming Booking.com guests since 11 Jun 2005. 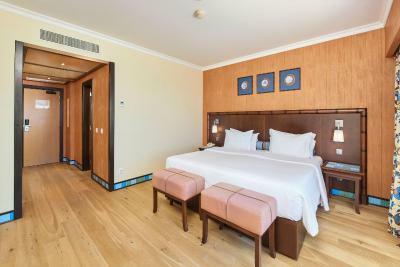 When would you like to stay at Grande Real Santa Eulalia Resort & Hotel Spa? 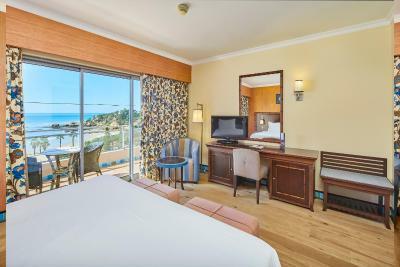 This air-conditioned room features views of the sea, free WiFi, satellite TV, minibar, telephone and radio. 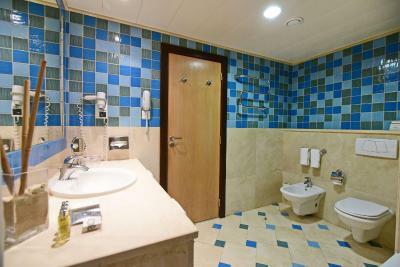 Private bathroom includes hairdryer and free toiletries. Apart from the 2 adults this room can also accommodate 1 child in a rollaway bed, maximum until 12 years old, with no additional cost. 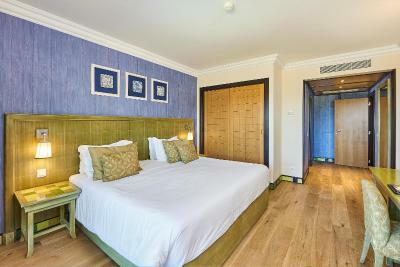 This air-conditioned room features views over the resort, free WiFi, satellite TV, minibar, telephone and radio. 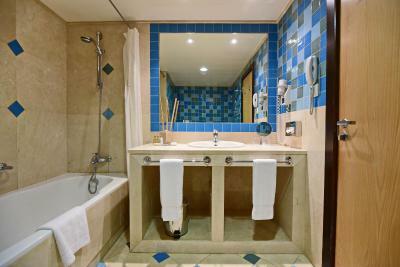 Private bathroom includes hairdryer and free toiletries. This room can accommodate 2 adults and a child up to 2 years old. 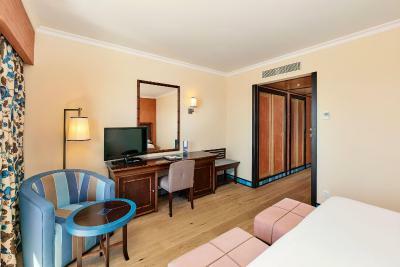 Spacious self-catering apartment with separate bedroom, sophisticated living area and a complete kitchenette. This apartment has a capacity for 3 Adults or for 2 Adults + 2 Children up to 12 years old. Self-catering Studio Apartment with kitchenette. Can accomodate 2 adults and 1 child up to 12 years old. 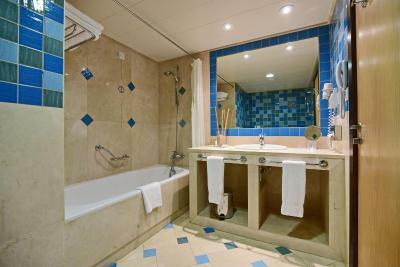 Featuring a bathroom with whirlpool bath, separate living room with guest bathroom and 2 terraces. Capacity: 3 adults + 1 child or 2 adults + 2 children. Children are accommodated in rollaway beds. This suite features a balcony, minibar and sofa. This suite has a balcony, bathrobe and sofa. This apartment features a balcony, minibar and electric kettle. - Free parking and WiFi. This apartment has a balcony, bathrobe and dining area. The Real Hotels mission is to provide our clients unique experiences in our Hotels, top quality products, with excellence in the service provided with the best quality and price ratios. 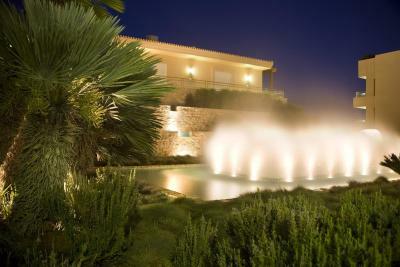 House rules Grande Real Santa Eulalia Resort & Hotel Spa takes special requests - add in the next step! Grande Real Santa Eulalia Resort &amp; Hotel Spa accepts these cards and reserves the right to temporarily hold an amount prior to arrival. Grande Real Santa Eulalia Resort & Hotel Spa accepts these cards and reserves the right to temporarily hold an amount prior to arrival. Please note that the dynamic pool with thalassotherapy circuit and spa are available for an additional fee. Guests should check the maximum capacity of the accommodation before booking. Please note that guests must be 16 or older to access the thalassotherapy pool circuit at Real Spa Therapy. Subject to appointment. We didn't like the poor choice of food at buffet breakfast and dinner. When paying such high price we would expect better choice and quality. The beds/mattresses were quite old, squeaky and not very comfortable. There was a musty smell in the bedroom. No full length mirror in room - had to stand on toilet to see outfit. Room could have been cleaned bit more everyday. Beds made well though ! Beautiful hotel , spacious. Friendly. Great breakfast , lovely room. Room was not 5 star - beds and air con could be better. Breakfast time was awful, overwhelmed the hotel clealy could not handle the capacity of people. Barely space to move, food im sorry to say was disgusting. Cakes were good and fresh bread. Terrible system and service, i dreaded it every day and wished i hadn't paid extra to eat in the hotel should of eaten out. Portugal has amazing restaurants/eateries shame this hotels food does not reflect that. Sadly would not stay here ever again. Very crowded at times, which is credit to the excitement and offerings of the breakfast. Maybe need a dedicated seperate omelette area for people to customize orders. Was not very child friendly. Options for young children (ours is 4) were very limited. Lovely place, very clean, beautiful views. The quality and service of hotel doesn’t deserve 5 star. Many cracks are observed in the washing basin.